When you’ve spotted the car of your dreams and the price is right, contact the owner and check the facts. Engine size, model code, year model and mileage may sound like a big bag of “HUH?” but can vastly affect the actual value of the car. Gather all the needed info and ask a friendly used car dealer for the retail and book value of the vehicle. You obviously don’t want to be paying more than the vehicles value. I do believe in girl power but putting your life in danger is SO not a good look. When viewing the vehicle be sure to meet in a public place and take someone along with you. It would be to your advantage if that someone is proficient in car talk but if they’re not, here’s what to check: The body work (accident damage and rust on the bonnet, boot and doors); The mechanics (lights and indicators) and the tyres. The vehicles license disc must be up to date and the vehicle must be ‘roadworthy ready’! What’s this “roadworthy” I speak of? Well, by law all vehicles must have a roadworthy certificate. This means that the vehicle is safe to drive and not a hazard to other motorists. You will need to get the vehicle certified soon after purchase. Once the purchase has been concluded make sure you are given the vehicles original service book (if it has one). To transfer ownership onto your name the seller has to give you the vehicles original registration document (or else the car is not really yours! ), a certified copy of his ID document, a letter giving you permission to remove the vehicle from his name and a completed NCO document. You can take these along with your roadworthy certificate, recent proof of address and completed RLV form to your nearest Post Office to do the transfer. 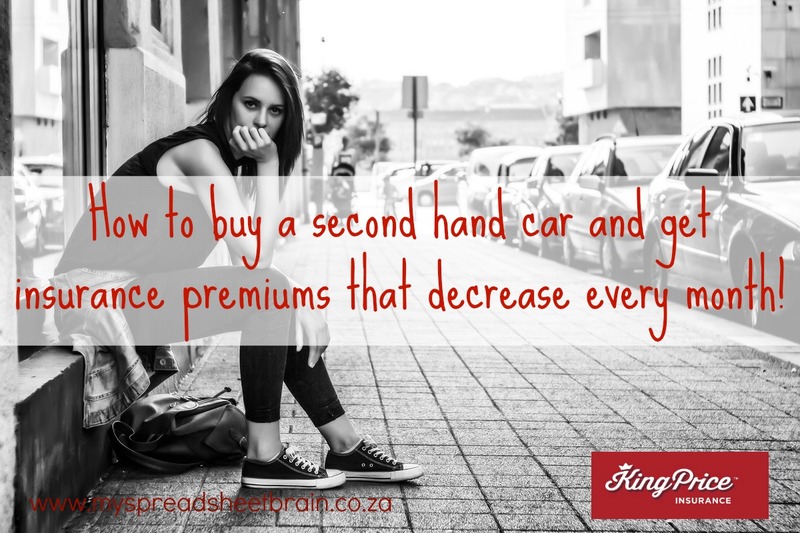 Who knew that buying a second hand car would be so easy, right? Let’s face it, if you’re a mom or a lady on the move, you don’t have the time to be stuck without your vehicle! Car insurance is always in style, if you know what I mean. Especially if you’re not gifted in the parking department (or is is it just me?). The truth is: you need to make sure that your vehicle is covered! To do this, simply visit the King Price Insurance online quote form and follow the easy prompts to receive a super cheap estimated premium. The cool thing is that with King Price Insurance, your premiums actually DECREASE monthly, as the value of your car depreciates! Yep, you read right! I don’t know about you but I’d choose decreased premiums over inflated rates and “no claim bonuses” any day. You are able to insure just about anything, even your portable possessions. I mean, my handbag is important, yo! Not forgetting all those other valuable electronic gadgets and even your beloved jewelry. With King Price everything is covered. There are many glorious perks that come with being a King Price client. Things like Emergency Assist and Kings Cab (A personal chauffeur? Uhm yes please!) that makes going with them a no brainer! Let’s get with it, girl! Visit the King Price website today and check it out for yourself. disclaimer: this post was sponsored by King Price Insurance but all the content is my own. i promise.